Sheryl Denbo, contemporary abstract artist specializing in mixed media, gold and silver sculptural paintings. Teachers: Helen Corning, and Bruce Dorfman. Helen’s style was abstract/minimalist with many Asian influences. She taught me to limit my color pallet and trust myself enough to reach a zone or creative space from which the work emerges. 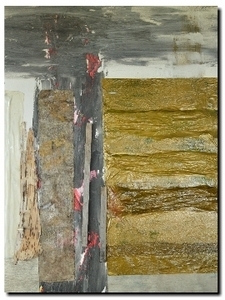 Under Bruce Dorfman, I fell in love with mixed media. He creates abstract, monochromatic sculptural canvases using found objects. He taught me to explore my intention, and focus on how to get there. Helen Corning and Bruce Dorfman both encouraged me to find my own creative energy and to trust it—and then, to move ahead to continue to develop the work. Artistic influences: Gustav Klimt and Robert Rauschenberg. Gustav Klimt was a dramatic Austrian painter of the early 20th century, who experimented with abstract painting, symbolism, and gold. Unlike other painters, he was proud to be a decorative painter. Robert Rauschenberg, an abstract expressionist of the late 20th century, used found objects to create assemblages that are not unlike my own “Car Parts” and “Trash Series”. His lesser known gold leaf paintings, grounded on newsprint, have been an inspiration to me. Rauschenberg happily blended kitsch and fine art. Sculptural canvases are developed through a complex process that builds the surface until it transcends its original structure. Using traditional fabrics from around the world, I introduce metallic color, gold, silver and copper paint, paper and leaf. The three-dimensional and metallic nature of these sculptural paintings create apparent changes in color and tone as the light changes and/or the viewer moves. My use of classic materials while employing abstract expressionist style closes the divide between old and new, giving the canvas a dramatic and timeless appearance.